Okay, so I finished Sense and Sensibility! What a wonderful book...I so enjoyd it! That means 367 pages complete plus the 211 pages I read of Under the Dome. Now I'm going to pick up Under the Dome again and try to read all night (I was somewhat over-indulgent in my napping on Sunday). I will either read a couple hundred more pages of Under the Dome and pick up something else (perhaps The Lady and the Unicorn by Tracy Chevalier) or I will plod on with the 1074 page Stephen King tome. It is a great read so far. 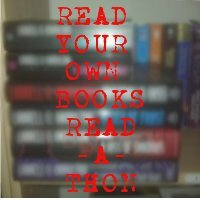 The official end time for the read-a-thon is 9:00 am Monday, but since I started at 12 noon on Friday, I will read until 12 noon on Monday. Stay tuned for my wrap up post later today!